It's another banana day! I'm always very tempted to use the bananas hanging in the kitchen wall when I see it. I'm not a banana person. However, since I took up baking, I've like to use bananas as my ingredient to bake cakes, especially chiffon cakes and butter cakes. This evening, after browsing through my recipes, I decided to bake banana cupcakes. I added walnuts to the recipe. Then decided to frost it as the look of it was quite ordinary. Finally, I came out with my own version. 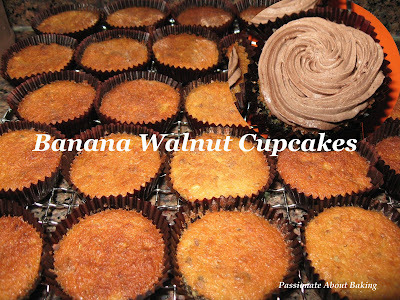 Recipe extracted from Crazy About Cupcakes-Banana Cupcakes (with my own modification). 1. Preheat the oven to 160°C. Line cupcake pans with cupcake papers. 2. With an electric mixer on medium speed cream the butter and sugar together until fluffy, about 3-5 minutes. Add the eggs to the mixture, and beat well. Add the bananas to the creamed mixture and mix well. 4. Add all the dry ingredients to creamed mixture at once. Mix until the dry ingredients are completely integrated. 5. Add the milk. Mix batter for 1 minute on medium speed. 6. Fold in the walnuts lightly, but thoroughly. 7. Fill cupcake liners three-quarters full with batter. Bake for 20 minutes or until a toothpick inserted in the center of the cupcakes comes out clean. Cool cupcakes in a wire rack. 1. Beat cream until slightly thickened. 2. Gradually add sugar and cocoa powder. 3. Beat until stiff peaks form. 4. Start frosting the cupcakes when it's cooled. 5. Sprinkle chocolate rice on the frosting generously. We are in the 'same boat', whenever i see banana, i always think of baking something. I also did some banana muffins on Sunday, and just yesterday, i was thinking of whipping chocolate butter cream for my cake. I may use your cocoa whipped cream icing for my bake. 'Baked-minds' think alike?? Yes, "baking minds" think alike! Yourself, Yuri & myself like to use banana to bake! But I think banana is a very versatile fruit, don't you? Jane, you are my idol now! I may try it. The whipping cream is the dairy whipping cream or those for dessert, spray kind?? Aiyo! My recipes are never difficult mah! :p I'm as simple as my bakings! :) Yes, try this simple recipe. But don't overbeat the butter & sugar. You can add choc rice into the batter itself. It's very versatile. Get the whipping cream and whip yourself, so that you can add the sugar & cocoa powder. If you get the spray kind, it's quite difficult to add the cocoa powder to whip. Unless you want the frosting to be normal whipped cream, then topped them with choc chips or choc rice, or even nuts if they like, or all of them! The whipping cream is actually very nice, very chocky but not too sweet too! Try it and let me know the results yah? 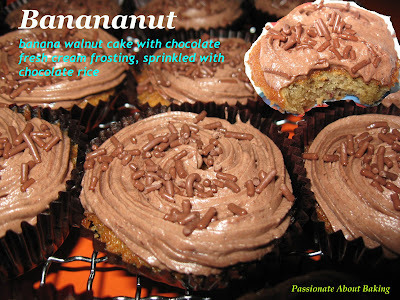 This recipe looks great... definitely will try it when I have left over bananas hanging at my kitchen cabinet. Tks for sharing this wonderful recipe. hi im always very perturbed between cupcake muffin and cakes.. i noe cupcakes are nicely decorated lil cakes. what abt muffins and normal cakes? how diff are they?